Sometime last fall, I decided to use fairy tales in my storytelling workshops. It wasn’t one of those careful choices that one makes based on some kind considered decision-making process. 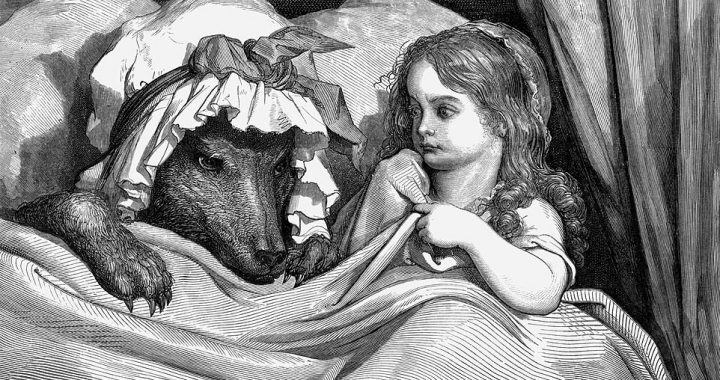 It was something I threw out in a conversation because I found it entertaining to ask academics to talk about Little Red Riding Hood. My workshop audiences are PhD students in sciences, business students, language instructors, and entrepreneurs. When it comes to teaching material, I can either look examples that are familiar to each group or use material that is so familiar, we think it’s child’s play. I chose the latter. Fairy tales defy everyone’s expectations and that’s perfect for me. I elicit fairy tales instead of telling, inviting the audience to fill in the details while also giving them different versions of the story. Fairy tales are familiar, but just beyond reach in our working memories. It’s entertaining for a room full of adults to realized they don’t really know Little Red Riding Hood or Cinderella. The energy in the room shifts from focused learning to playful story time. Later, I ask participants to analyze a fairy tale structure based on my version of story structure theory. They have to dig into a narrative to try to understand how it works. It’s when the magic happens. In terms of learning theory, participants use the story structure they’ve just learned, thus pushing them at least two levels up Bloom’s Taxonomy from knowledge to application. This increases the effectiveness of their learning and improves the chances that they will remember and be able to use the structure later. the climax in Cinderella when the clock rings 12 when the shoe fits? These questions compel the group to review story structure and make choices about how to apply it. The longer groups work, the more complex their questions are. Give them five or ten minutes and they focus on finding plot points. Give them an extra five minutes and groups discuss whether the structure changes depending on the story’s message. They ask themselves how the story would be different from another character’s perspective. Starting on the familiar terrain of fairy tales, participants venture deeper into story analysis territory than I could accomplish trying to lead them there in a discussion or presentation. They become the heroes on their own journey through storytelling theory, encountering unexpected obstacles, and working with their newfound allies to solve problems they never expected to encounter. I’ve been astounded by what this exercise brings out of a group and the level of conversations that result. Participants take their learning process in hand and come back with important questions about where they can apply story structure in different contexts, how to deal with content complexity. They will most likely never see fairy tales as simple stories again. So, what started as a lark has become a core component how I approach storytelling and story structure. I’m convinced that fairy tales are a vital step in learning about story. They provide a model that every storyteller can fall back on and offer problems that are wonderfully challenging to solve. Posted in Storytelling, workshops and tagged fairy tales, methodology, structure, teaching.